Read more about the Arizona wildfire from CNN affiliate KNXV. 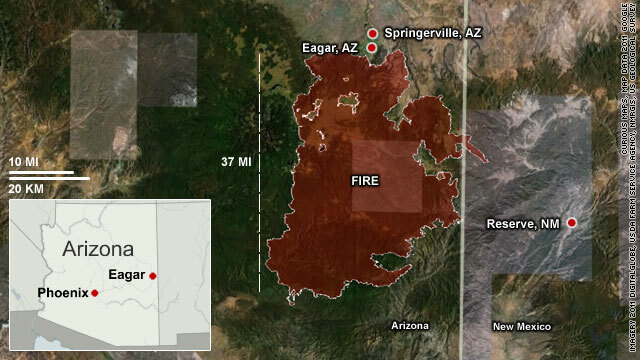 (CNN) -- Firefighters in eastern Arizona gained some traction Tuesday in their fight against what one official said is now the state's largest-ever wildfire. Officials stepped back from an earlier claim that the fire had become the largest in Arizona history early Tuesday, saying that when the acreage burning in New Mexico was subtracted from the total, the Arizona portion of the Wallow fire was smaller than the 2002 Rodeo-Chediski fire. But later in the day, an official said she was confident the fire had grown and surpassed the previous record. "I can say yes," said Suzanne Flory, a fire information officer. She said officials still do not have a breakdown of how many acres in each state have burned. The Rodeo-Chediski fire scorched 722 square miles in Arizona. The Wallow Fire has so far burned 733.5 square miles in Arizona and New Mexico, according to official figures. It is continuing to grow. The blaze, which has destroyed 32 structures but caused no serious injuries, is 18% contained, fire officials said Tuesday. "The great news on this incident is we still have a total of seven injuries and they're all minor," said fire incident command spokesman Peter Frenzen. Jayson Coil, a manager with the incident response team, said forecast winds from the northwest could fan flames in areas that have been previously sheltered from the fire and push the blaze south. Fire teams are most closely focusing on the area north of Luna and west to Alpine, communities on the fire's eastern flank, Coil said. Luna is located in New Mexico. Firefighters are working nine miles of fire line close to population centers in that high-priority section of the fire, he said. They were burning vegetation near the Luna Lake area Tuesday in a bid to strengthen and connect containment lines. On the west side of the fire, commanders are focusing on shoring up containment lines around Burro Mountain and the Sunrise Ski Resort, Coil said. "There's a line of mixed conifer where that line was put in, and because of that it's requiring a lot of extra suppression efforts," he said. "That mixed conifer holds (heat) for a long time." Conditions around Greer, Arizona, also continued to improve, with power restored to the area, Coil said. But it is unclear when residents of that community might be allowed home. Crews continued to patrol areas around Springerville and Eagar, where some burned-out areas began to smoke Monday because of the ultra-low humidity in the area, Coil said. Residents were allowed to return to the communities, which are about 170 miles east-northeast of Phoenix, on Sunday. More than 4,700 fire fighters continue to work the Wallow Fire, which is the largest fire currently active in the United States, according to Inciweb, an interagency fire information service. Elsewhere in Arizona, high temperatures and strong winds are fueling at least four other fires, with a combined burn area that tops 250,000 acres. The largest of those fires is the Horseshoe Two fire, located in southern Arizona, which started on May 8. The blaze, which has so far scorched 171,333 acres, is 53% contained. Firefighters have said that blaze has been difficult to get ahead of because of the area's steep terrain and relative isolation. CNN's Phil Gast and journalist Craig Johnson contributed to this report.